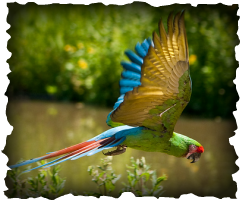 With 1,800 species, Peru is one of the richest countries in the world for birds. Over the course of 26 days, we explored the many ecosystems of Peru, from the coastal region of Paracas, through the cloud forest, and down into the Amazonia rainforest. Armed with our binocs and multiple copies of Birds of Peru, we identified over 300 species of bird! (complete list below). Every successful birding trip starts with a good pair of binocs. Unless you have super human vision, these will be essential to see deep into the jungle or high into the sky. Even if you can see a bird clearly out in the open, you need to get as good a look as possible to identify most birds. Additionally, a good pair of binocs will help you get the most out of the trip and notice the the beautiful features these birds have to offer. 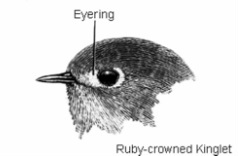 Using the figures surrounding this post as a guide, familiarize yourself with bird terminology and common marking spots. 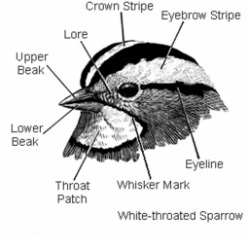 When you spot a bird, start looking for key features like a throat patch or crown stripe. Take note of the overall size of the bird and look for distinguishing features such as beak shape and overall posture of the bird. There are lots of birds in Peru....lots. So, to help yourself narrow it down, look at your surroundings. What elevation are you at? What type of environment are you in? Are you near water? All these things will help you figure out what bird you're looking at when you go on to step 4. The bird book is your friend. With over 1,800 species of bird its nearly impossible to identify birds accurately without a good bird book. The Princeton Field guides Birds of Peru is an excellent resource, with lots of colorful pictures and descriptions to help you find out exactly what you're looking at. Once you start flipping through your bird book , you will realize that you didn't really get that good of look at the bird you are trying to ID. Hopefully, that bird is still around and you can take a closer look. The more you go birding, the more familiar you'll get with how to find markings and soon you may not even need a second look! If all else fails, contact Dr. Silman as he is an expert on all things bird. Even if you have one or two identifying features he will be able to point you in the right direction. If you really want to test his skills, listen carefully to the bird you are trying to identify and try and mimic the sounds for him. 7. Good luck and have fun! Remember birding is about getting out in nature and enjoying the beautiful sights it has to offer. Don't get discouraged if your having trouble finding and identifying birds. Like all things, it takes time to get good at. Keep going out and looking for birds and you'll soon be rewarded! 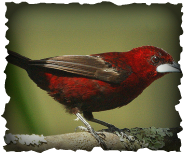 The quintessentially gaudy tropical bird; one of the most widespread and common tanagers in Amazonia, up to 1300m. Found in the canopy of humid forest. 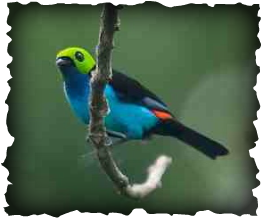 One of the many tanagers of San Pedro, the paradise tanager sticks out due to its unique combination of colors. Made up of green, blue, red, black , purple, and yellow, this bird has more color than a pack of skittles! An exciting bird we often saw in mixed tanager flocks, it was one of the prized birds of the trip, and I think Jay was the first to spot one! Widespread but uncommon in eastern lowlands up to 1800m. Ambushes prey from perch, but frequently soars, especially at mid-day and often to great heights. Also known as the "breasted chested eagle" (not really, but that's what Jay would have you believe), a beautiful bird but one that is very difficult to spot. 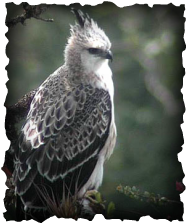 Thanks to the expert eye of Dr. Silman, we saw one on a birding excursion in San Pedro sitting perched far up into the mountain side. Using the scope we were able to get a great look at look at it. Common resident on coast, breeding on rocky cliffs both mainland and on offshore ilands. Adult has spectacular white tufts and a red bill. 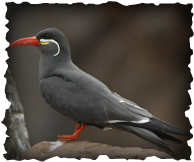 One of the first birds we spotted while on the coast in Paracas. Easily identified by its white "mustache." It was an early favorite on the trip and one of the first birds we could identify. Uncommon to fairly common in humid montane forest, 1100-3300m. My personal favorite bird, I first saw it in San Pedro perched on vine exposed and showing off its beautiful tricolored belly. Its green white and red stripes look more like a national flag than a bird, and they stick out well against a forest backdrop. An amazing sight in the wild. Widespread and common in second growth and forest edge throughout Amazonia. I first noticed the silver-beaked tanager while trying to find my 16 birds so I could eat lunch in San Pedro. Its shinny beak stands out against the males darker almost black body. When you really get a close look at the bird, you can see its distinctive red hue which makes it all the more amazing. Fairly common and wdespread in lowland forest in Amazonia. 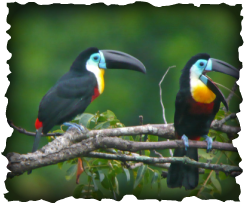 Best distinguished by song, usually given from an exposed perch in the canopy is a series of croaks: "keer keer keer..." Know for their bright colors and distinguishable bills, its hard not to love a toucan! 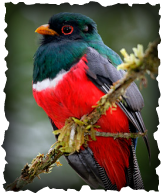 These colorful birds were often seen around Cocha Cahsu, especially in fig trees, and while we were riding along the river. 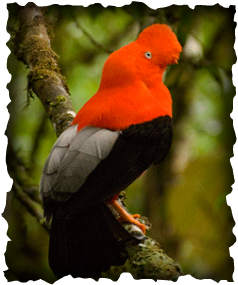 The Emblem of humid montane forests; often proclaimed Peru's national bird. Nest on edge of rock face, often near streams. While in San Pedro we had the pleasure of watching this bright orange bird perform its daily mating ritual. Everyday, a number of these birds come to the same place, called a lek, to vie for female attention. For about 30 minutes, these birds put on the show of a lifetime, it was quite a sight to see. Locally fairly common, but largely restricted to east slope of Andes and outlying ridges, 600-1500m. Associated with cliffs on steep ridges. While in San Pedro, we did a lot of birding. One evening as we were returning to the lodge, a few of us happened across this beautiful emerging from the forest. It's radiant green color stood out against the sky and we watched as the birds flew off into the sunset. 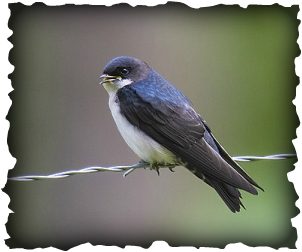 A widespread, familiar swallow; frequently seen in cities and towns. Common on both slopes of the Andes. Adult white below, with black vent and under-tail coverts. Call a shrill yet somewhat liquid "tew." When we arrived at our hostel at Machu Picchu, our rooms weren't ready yet, so we spent sometime in the dining area birding. As we looked out over the river flowing by, we noticed a number of small swallows fluttering around. Grabbing our binocs, we took a closer look and were presently surprised by the vivid blue backs of these birds. We continued to spot them throughout the trip and they quickly became a class favorite. 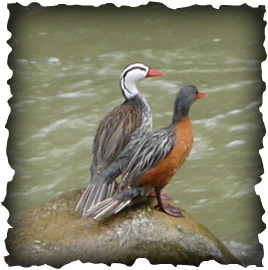 Fairly common on the east slopes of the Andes, the Torrent Duck is a characteristic bird of clear, fast-moving, boulder-strewn rivers and streams, in both open and forested regions. The female has a gray neck and cinnamon color on the chest while the male has a black and white head and neck. Our first encounter with these wonderful birds came on the train ride to Machu Picchu, when we noticed a pair of them sitting on the edge of the river flowing next to the tracks. Later on, they would become the inspiration for some cross river swimming after our long hike to San Pedro.